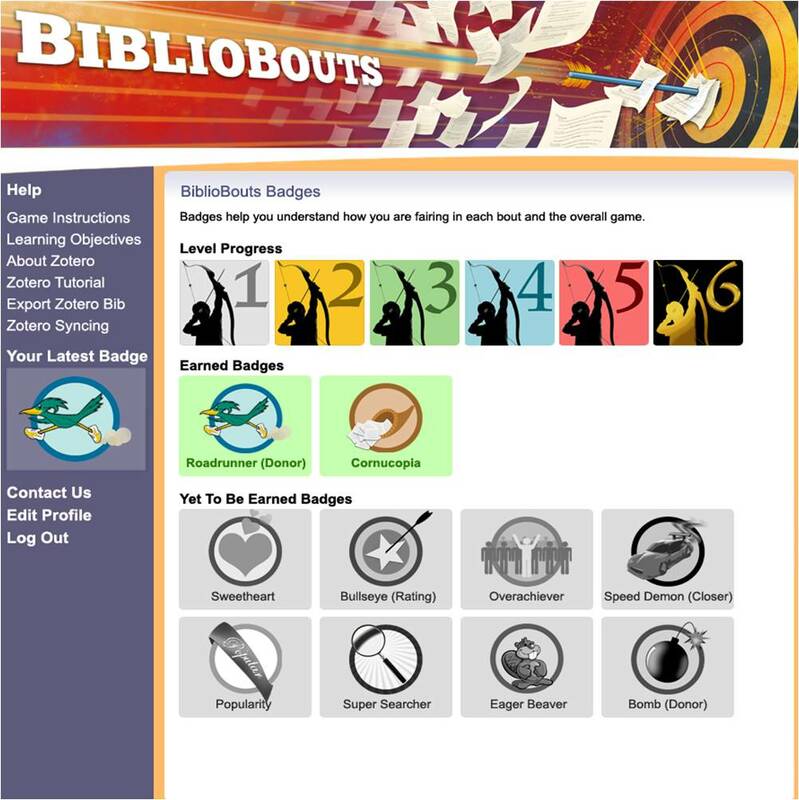 BiblioBouts is an online social game designed to teach college students to conduct high-quality, thoughtful research. The game was created by a team of researchers at the University of Michigan’s School of Information, thanks to a grant from the Institute of Museum and Library Services. Since they received the grant in 2008 they have designed, developed, pilot-tested, and refined the game. BiblioBouts asks students to locate high-quality, relevant sources on a given topic (the topic is chosen by the instructor). After students find the sources and their full texts, students import them into Zotero (http://zotero.org), an open-source citation management tool. Students are then asked to evaluate the sources found by the class based on credibility and relevance criteria, and finally, to choose the 10 most high-quality, relevant sources to answer their research question. 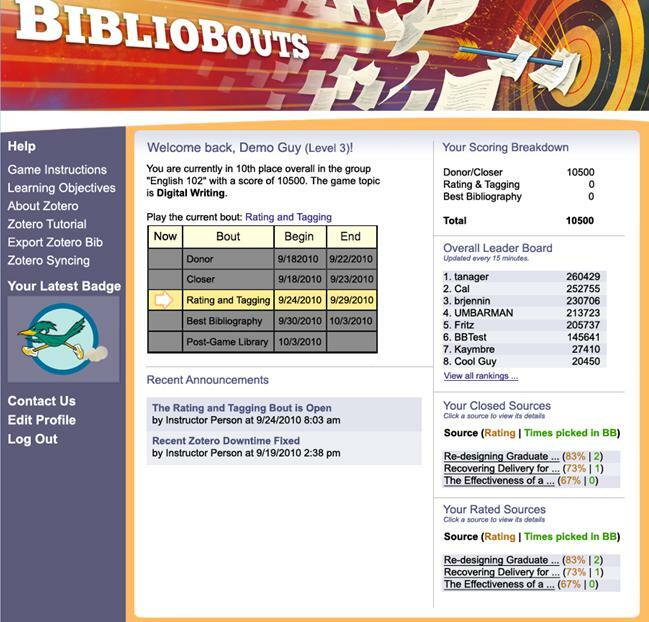 Each student is asked to choose an alias at the start of the game and that alias is displayed on a leader board ranking student scores throughout the game. Players win points for meeting and exceeding quotas and bonus points for certain achievements. In the most recent version of the game, students are also able to unlock badges for completing tasks quickly and/or particularly well. The game can be played as an assignment in or out of class, or could be used as extra credit. It can easily be included in an information literacy course but can also be extremely useful in a discipline-specific course as a supplement to information literacy instruction. Game play results in ten high quality, relevant sources on a given topic. These sources could then be incorporated into a paper, an annotated bibliography or any number of assignments. While incorporating Bibliobouts into my Spring 2010 Introduction to Information Literacy course, a 3 credit course for freshman, I found students were eager to locate high quality resources using the library’s databases in order to improve their score. One morning, before class started, I overheard a student who had been consistently at the top of the leader board explaining to her classmates how to locate relevant articles using the library databases. Students were motivated by the competition against their classmates and willing not only to search for better resources, but to understand what made one source ‘better’ than another. 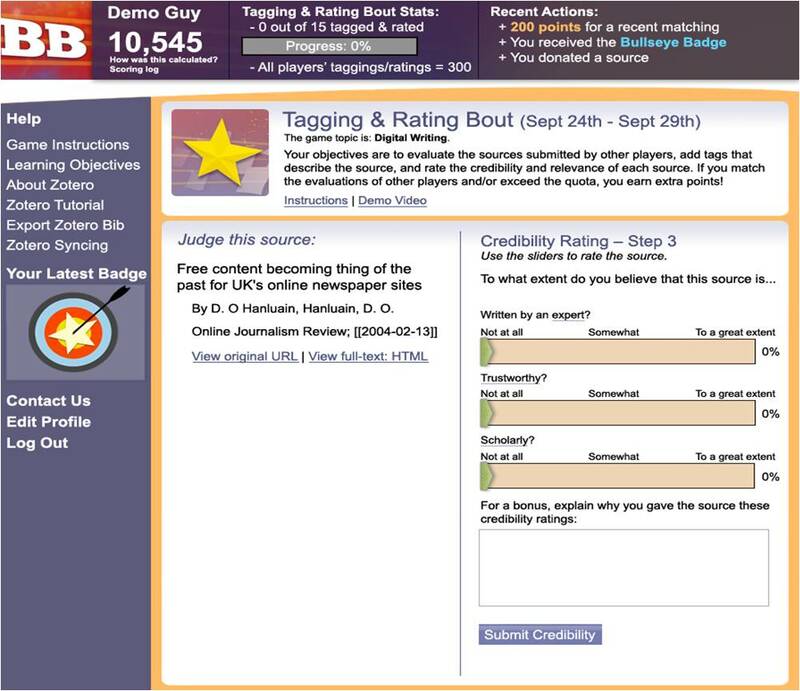 The game asks students to consider a number of characteristics of a source during evaluation and compares a given students rankings to that of his or her classmates. Some students, though, found the technology to be a bit overwhelming at first. Because many students had never used Zotero (which is necessary for game play) or the Bibliobouts interface, there was a steep learning curve. Many students found Zotero to be a useful tool long after game play ended. For more information, contact info@bibliobouts.org. Catherine Johnson is a Reference & Instruction Librarian and Instruction Coordinator at the University of Baltimore. She teaches a required, 3-credit information literacy course for freshman along with numerous one-shot instruction sessions. Catherine holds a Masters in Library and Information Science from Syracuse University. Her research interests include how cognitive development affects students’ ability to learn information literacy, how information literacy can best be integrated into the university curriculum and effective pedagogies for information literacy instruction. Catherine, this is very intriguing! Could you comment on how much instruction/support is needed to make this successful (above and beyond the usual research instruction)? Shana, that’s a tricky question to answer. The support necessary is very dependent on the primary instructor’s comfort with the game and the technologies used. What I’ve heard from others is that there are typically 2 full class sessions with the librarian. The first would introduce the game and the technologies (including Firefox and Zotero). The second session would focus more on the library resources available, searching techniques etc. Students would then be asked to take what they learned in those sessions and apply them to the game. After those sessions the librarian would typically work very closely with the instructor and the class to answer questions. This may even take the form of a quick (maybe 15 minute) session at the start of the class before students begin a new “bout.” The librarian could explain the value of evaluation, some tips for effectively evaluating sources, how to decide if a source is appropriate for your topic or any other issue with which students might be struggling. In short, the librarian can be very involved and the students will benefit from that involvement, but the game could also be played without a librarian at all. Again, this is all very dependent on the instructor. Hope this helps! If you have other questions, I’m happy to answer them! It does! Thanks very much Catherine. Keep on meaning to learn Zotero and this is as good an excuse as any.